A friend mentioned the other night that she'd taken her mom shoe-shopping in St Cloud last week. She said it was tough finding the "right" dress shoes in a size 10 (40 or 42, European). It seemed like the choices were limited--lots of cute shoes in smaller sizes, but not in tens. Since that's my size too, we commiserated. Do they order fewer large size shoes in the first place, or, do the tens sell so well that there aren't many left by the time I need shoes? I know, that's not historical. Deal. 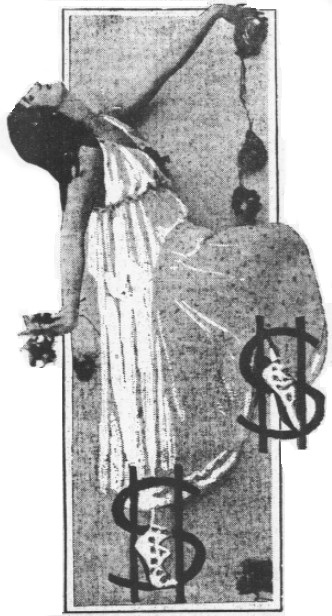 This next came from an 1875 ad in the St Cloud Journal by one J.E.West and a group of speculators trying to raise capital to build the Grand Central hotel. Check the huge list of prizes that might be won by those buying shares (right column at the link). 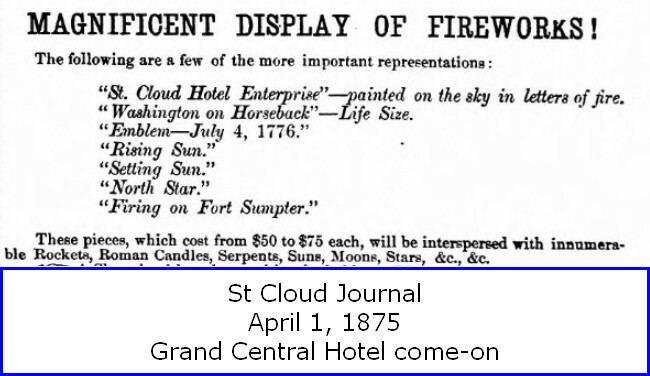 This was April first, a celebration planned for July third, and the hotel would be finished by October first, 1875. The timeline was remarkable all by itself, but look at the list of fireworks--how was this possible? I mean, did anyone actually see the words "St. Cloud Hotel Enterprise" written in fire in the sky? 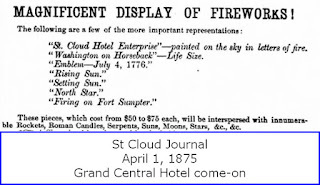 And if so, how come last night's fireworks were "just" unnamed colorful starbursts? 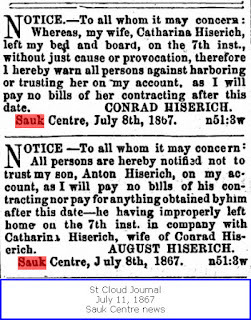 And while we're checking pages from the St Cloud Journal, here's an interesting pair of announcements from two unhappy men in Sauk Centre. 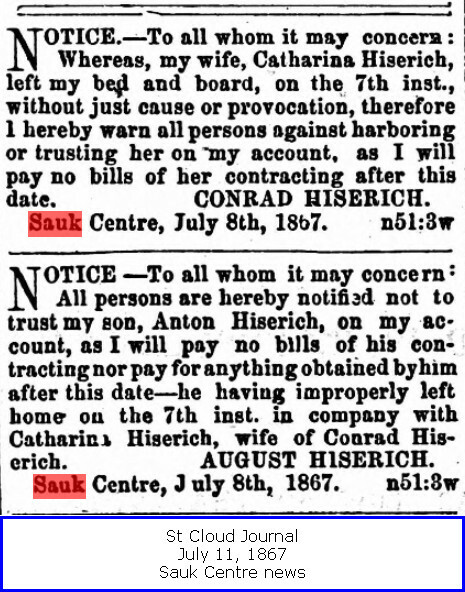 Wouldn't you love to know what actually happened there?